Rima E. Laibow MD, Natural Solutions Foundation Medical Director, saying Nano Silver likely to address genetically novel Ebola Virus offers hope for nations impacted by the West African Ebola outbreak and the rest of the world. "No one has to die from Ebola; the Natural Solution already exists: Nano Silver." 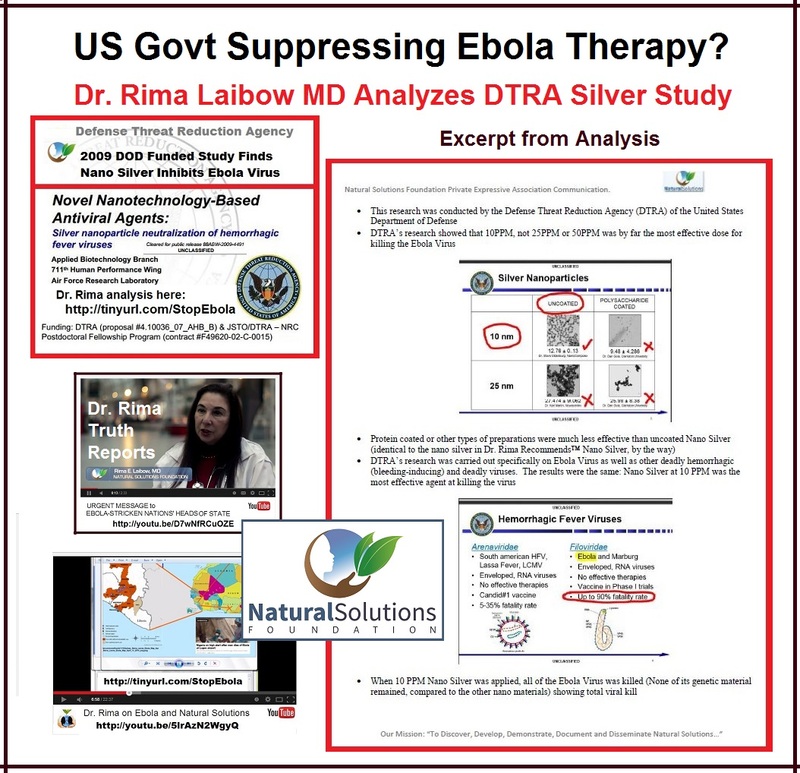 DID US GOVT SUPPRESS 2009 STUDY OF EBOLA AND NANO SILVER? An Ebola Virus outbreak caused by a novel Ebola strain, which was apparently introduced into the human population through a single case in 2013, now threatens to spread globally. Accelerating since that time, the devastating disease, which WHO says kills up to 90% of its victims, is raging through West Africa and threatens to break out into countries with transportation links to that area. Current “authoritative” information asserts that there is no prevention and no cure for the disease, whether it has been weaponized (as some believe) or not. Based on strong scientific evidence, however, Rima E. Laibow, MD, Medical Director of the Natural Solutions Foundation, disagrees and says that both therapy and prevention for this deadly disease exists. Dr. Laibow says that the genetic changes which make it so deadly do not make it immune to the mechanism of action of Nano Silver so there is, in fact, a simple, non-toxic prevention and therapy nutrient which has proven effective against every pathogen tested worldwide. In fact, Dr. Laibow sent an Open Letter on July 29, 2014 to the 4 Heads of State and their Ministers of Health of the African nations most directly impacted by the current Ebola outbreak: Nigeria, Liberia, Guinea, and Sierra Leone, together with other world leaders, including the President of the United States and the Directors of the World Health Organization and Doctors Without Borders. In that letter, Dr. Laibow, who was invited to address 47 African Ministers of Health in Mombasa in 2007, pointed out the powerful advantages of Nano Silver in the current Ebola outbreak stating, “The entire world grieves with you and watches in fear and hope as the terrible Ebola virus takes an increasing number of lives in your countries while valiant people try to stem the tide. But, without effective, inexpensive countermeasures, containment will, as we all know, be impossible. The recent kidnapping of an afflicted woman from a hospital in Freetown, her subsequent death, and the arrival of an Ebola victim at the airport in Lagos makes that all too apparent." Dr. Rima, as she is widely known, is a world-renowned physician who has practiced drug-free psychiatry and environmental medicine for over 40 years. She urges safe, gentle, and effective natural solutions to health care issues, including the most serious. The use of Nano Silver, a natural nutritional remedy, as Dr. Rima notes in her review of relevant scientific literature, has enormous promise as a well-documented therapeutic strategy against every known pathogen; even if this highly lethal variance of the Ebola virus has been weaponized, as recent reports indicate. Because of its unique method of action, organisms cannot become resistant to Nano Silver, which is approved as a non-toxic surface cleaner for hospital and food service areas by the US FDA. Dr. Rima will share her Nano Silver Pro-Immunity Protocol with individuals and appropriate health care providers so that the victims of Ebola may have hope. Natural Solutions Foundation President, Maj. Gen. Albert Stubblebine III (US Army, Ret. 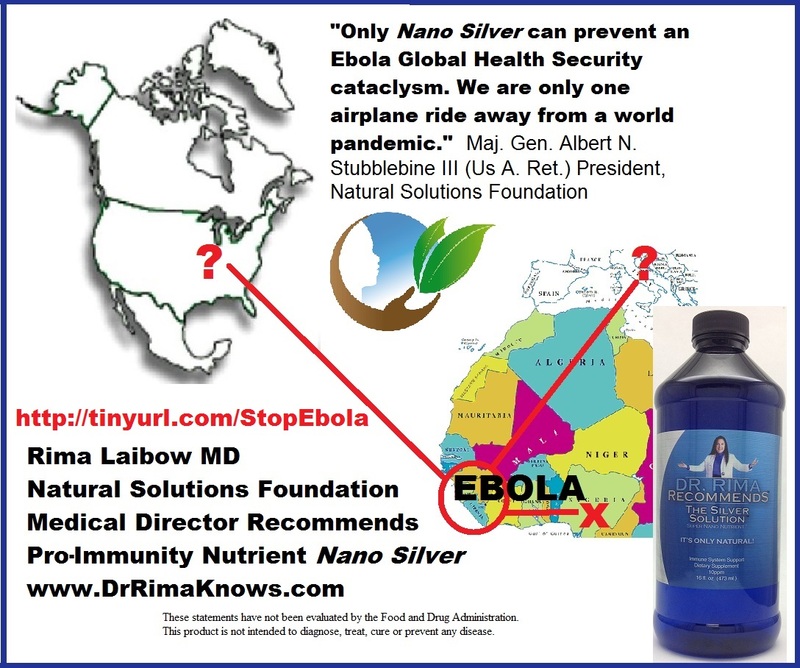 ), supports Dr. Rima's Open Letter by observing, "Only Nano Silver can prevent an Ebola Global Health Security cataclysm. We are all only one airplane ride away from a world pandemic."